Not to be confused with the Professional Golfers' Association of America. The PGA Tour (stylized in all capital letters as PGA TOUR by its officials) is the organizer of the main professional golf tours played primarily by men in the United States and North America. It organizes most of the events on the flagship annual series of tournaments also known as the PGA Tour, as well as PGA Tour Champions (for golfers age 50 and older) and the Web.com Tour (for professional players who have not yet qualified to play in the PGA Tour), as well as PGA Tour Canada, PGA Tour Latinoamérica, and PGA Tour China. The PGA Tour is a nonprofit organization headquartered in Ponte Vedra Beach, Florida, a suburb of Jacksonville. Originally established by the Professional Golfers' Association of America, it was spun off in December 1968 into a separate organization for tour players, as opposed to club professionals, the focal members of today's PGA of America. Originally the "Tournament Players Division", it adopted the name "PGA Tour" in 1975 and runs most of the week-to-week professional golf events on the tournament known as the PGA Tour, including The Players Championship, hosted at TPC Sawgrass; the FedEx Cup, with its finale at The Tour Championship at East Lake Golf Club; and the biennial Presidents Cup. The remaining events on the PGA Tour are run by different organizations, as are the U.S.-based LPGA Tour for women and other men's and women's professional tours around the world. The tour began 90 years ago in 1929 and at various times the tournament players had attempted to operate independently from the club professionals. With an increase of revenue in the late 1960s due to expanded television coverage, a dispute arose between the touring professionals and the PGA of America on how to distribute the windfall. The tour players wanted larger purses, where the PGA desired the money to go to the general fund to help grow the game at the local level. Following the final major in July 1968 at the PGA Championship, several leading tour pros voiced their dissatisfaction with the venue and the abundance of club pros in the field. The increased friction resulted in a new entity in August, what would eventually become the PGA Tour. Tournament players formed their own organization, American Professional Golfers, Inc. (APG), independent of the PGA of America. Its headquarters were in New York City. After several months, a compromise was reached in December: the tour players agreed to abolish the APG and form the PGA "Tournament Players Division," a fully autonomous division under the supervision of a new 10-member Tournament Policy Board. The board consisted of four tour players, three PGA of America executives, and three outside members, initially business executives. Joseph Dey, the recently retired USGA executive director, was selected by the board as the tour's first commissioner in January 1969 and agreed to a five-year contract. He was succeeded by tour player Deane Beman in early 1974, who served for twenty years. The name officially changed to the "PGA Tour" in 1975. Beman was succeeded by commissioner Tim Finchem in June 1994. On January 1, 2017, Jay Monahan succeeded Finchem as commissioner. In late August 1981, the PGA Tour had a marketing dispute with the PGA of America and officially changed its name to the "TPA Tour," for the "Tournament Players Association." The disputed issues were resolved within seven months and the tour's name was changed back to the "PGA Tour" in March 1982. Without the tour players, the PGA of America became primarily an association of club professionals, but retained control of two significant events; the PGA Championship and the Ryder Cup. The former was an established major championship, but the latter was an obscure match play team event which was not particularly popular with golf fans, due to predictable dominance by the United States. With the addition of players from continental Europe in 1979 and expanded television coverage, it became very competitive and evolved into the premier international team event, lately dominated by Europe. Both events are very important revenue streams for the PGA of America. Due to the multiplicity of names, there is often confusion as to what the PGA Tour organization does and does not run. Of the events in the PGA Tour schedule, it does not run any of the four major championships (the Masters Tournament, the U.S. Open, The Open Championship and the PGA Championship), or the Ryder Cup. The PGA of America, not the PGA Tour, runs the PGA Championship, the Senior PGA Championship, and co-organizes the Ryder Cup with Ryder Cup Europe, a company controlled by the PGA European Tour. Additionally, the PGA Tour is not involved with the women's golf tours in the U.S., which are mostly controlled by the LPGA. The PGA Tour is also not the governing body for the game of golf in the United States; this, instead, is the role of the United States Golf Association (USGA), which organizes the U.S. Open. What the PGA Tour does organize are the remaining 43 (in 2009) week-to-week events, including The Players Championship and the FedEx Cup events, as well as the biennial Presidents Cup. It also runs the main tournaments on five other tours: PGA Tour Champions, the Web.com Tour, PGA Tour Canada, PGA Tour China, and PGA Tour Latinoamérica. The PGA Tour operates six tours. Three of them are primarily contested in the U.S., and the other three are international developmental tours centered on a specific country or region. PGA Tour, the top tour. Some events take place outside the United States: Canada, Mexico, Malaysia, South Korea, the Dominican Republic, and the U.S. possession of Puerto Rico host one sole-sanctioned event each year. The events in Puerto Rico and the Dominican Republic are alternate events held opposite World Golf Championships tournaments and therefore have weaker fields than regular Tour events. In addition, Mexico and China host World Golf Championships and the United Kingdom hosts a major championship. As of 2016, one regular tournament is held in Canada, and one of the senior majors is held in the UK, the rest in the US. Web.com Tour, a US developmental tour. As of 2014, Colombia, Panama, Chile, Brazil, Mexico, and Canada host one tournament each. As of 2014, nine Latin American countries host tournaments. Historically known as the "Canadian Tour", it was taken over by the PGA Tour in November 2012. The 2013 season, the first under PGA Tour operation, began with a qualifying school in California, followed by nine tournaments in Canada. Launched in 2014, it is independent of the former China Tour, which folded after its 2009 season. Golfers who finish 11th through 45th (including ties) are exempt until the second "reshuffle" of the following season (first eight events). On the Web.com Tour, a "reshuffle" refers to a reordering of the tour's eligibility list, which determines the players who can enter tournaments. After four tournaments, and every fourth tournament thereafter until the Web.com Tour Finals, players are re-ranked according to their tour earnings on the season. However, the ranking position of players who are exempt from a "reshuffle" does not change. Those who finish 2nd through 10th (including ties) are exempt until the third reshuffle of the following season (first 12 events). The medalist (top finisher) has full playing privileges for the entire regular season, which carries with it automatic entry to the Tour Finals. Since 2013, 50 Web.com Tour golfers earn privileges during the next PGA Tour season, which now begins the month after the Tour Finals. The top 25 money winners over the regular season (i.e., before the Tour Finals) receive PGA Tour cards, as do the top 25 money winners in the Finals. The priority position of all 50 golfers on the PGA Tour is based on money earned during the Tour Finals, except that the regular season money leader shares equal status with the Finals money leader. In addition, a golfer who wins three events on that tour in a calendar year earns a "performance promotion" (informally a "battlefield promotion") which garners PGA Tour privileges for the remainder of the year plus the following full season. At the end of each year, the top 125 in FedEx Cup points (top 125 on the money list before 2013) receive a tour card for the following season, which gives them exemption from qualifying for most of the next year's tournaments. However, at some events, known as invitationals, exemptions apply only to the previous year's top 70 players. Since 2013, players who are ranked between 126–200 in FedEx Cup points (and are not already exempt by other means) are eligible for entry in the Web.com Tour Finals, where they can regain their PGA Tour privileges. Non-exempt players who finish 126th-150th in the FedEx Cup but fail to regain their PGA Tour cards are given conditional PGA Tour status for the season and are fully exempt on the Web.com Tour. Winning a PGA Tour event provides a tour card for a minimum of two years, with an extra year added for each additional win with a maximum of five years. Winning a World Golf Championships event, The Tour Championship, the Arnold Palmer Invitational, or the Memorial Tournament provides a three-year exemption. Winners of the major championships and The Players Championship earn a five-year exemption. Other types of exemptions include lifetime exemptions for players with twenty wins on the tour; one-time, one year exemptions for players in the top fifty on the career money earnings list who are not otherwise exempt; two-time, one year exemptions for players in the top twenty-five on the career money list; and medical exemptions for players who have been injured or are going through a family crisis, which give them an opportunity to regain their tour card after a period out of the tour. In 2015, the PGA Tour added a clause which would freeze an exemption for those required to perform military service in their native countries in response to South Korea's Bae Sang-moon having to leave the Tour for that reason. At the end of the season, the person leading the FedEx Cup earns a five-year exemption. Non-members can play their way into the PGA Tour by finishing the equivalent or better of 125th in FedEx Cup points. Those who fail but fall within the top 200 in current season points are eligible for the Web.com Tour Finals. During the season, non-members can earn Special Temporary Member status by exceeding the equivalent of 150th in the previous season's FedEx Cup. Special Temporary Members receive unlimited sponsor exemptions, while non-members are limited to seven per season and twelve total events. Similar to other major league sports, there is no rule that limits PGA Tour players to "men only". In 1938, Babe Zaharias became the first woman to compete in a PGA Tour event. In 1945, Zaharias became the first and only woman to make a cut in a PGA Tour event. In 2003, Annika Sörenstam and Suzy Whaley played in PGA Tour events, and Michelle Wie did so in each year from 2004 through 2008. In 2011, Isabelle Beisiegel became the first woman to earn a Tour card on a "men's" professional golf tour, the Canadian Tour, now PGA Tour Canada. The LPGA Tour like all other women's sports, is limited to female participants only. An organization called the PGA European Tour, separate from both the PGA Tour and the PGA of America, runs a tour, mostly in Europe, but with events throughout the world outside of North America, that is second only to the PGA Tour in worldwide prestige. Several other regional tours are around the world. However, the PGA Tour, European Tour, and many of the regional tours co-sponsor the World Golf Championships. These, along with the major championships, usually count toward the official money lists of each tour as well as the Official World Golf Ranking. The PGA Tour places a strong emphasis on charity fundraising, usually on behalf of local charities in cities where events are staged. With the exception of a few older events, PGA Tour rules require all Tour events to be non-profit; the Tour itself is also a non-profit company. In 2005, it started a campaign to push its all-time fundraising tally past one billion dollars ("Drive to a Billion"), and it reached that mark one week before the end of the season. However, monies raised for charities derive from the tournaments' positive revenues (if any), and not any actual monetary donation from the PGA Tour, whose purse monies and expenses are guaranteed. The number of charities which receive benefits from PGA Tour, PGA Tour Champions and Web.com Tour events is estimated at over 2,000. In 2009, the total raised for charity was some $108 million. The organization announced to have generated $180 million for charities in 2017 through the tournaments of its six tours. The PGA Tour's broadcast television rights are held by CBS Sports and NBC Sports, under contracts most recently renewed in 2011 to last through 2021. While it considered invoking a option to opt out of its broadcast television contracts in 2017, the PGA Tour ultimately decided against doing so. Golf Channel (which, since the acquisition of NBC Universal by Golf Channel owner Comcast, is a division of NBC Sports) has served as the pay television rightsholder of the PGA Tour since 2007, and its current contract will also expire in 2021. Under the contracts, CBS broadcasts weekend coverage for an average of 20 events per-season, and NBC broadcasts weekend coverage for an average of 10 events per-season. Golf Channel broadcasts early-round and weekend morning coverage of all events, as well as weekend coverage of events not broadcast on terrestrial television, and primetime encores of all events. Tournaments typically featured in NBC's package include marquee events such as The Players Championship, the final three tournaments of the FedEx Cup Playoffs, and the biennial Presidents Cup event. The 2011 contract granted more extensive digital rights, as well as the ability for NBC to broadcast supplemental coverage of events on Golf Channel during its broadcast windows. The PGA Tour operates a streaming service known as PGA Tour Live, which carries early-round coverage of events preceding Golf Channel television coverage, including featured groups. The service is offered as a subscription basis, initially using BAMTech infrastructure, but moving to NBC Sports Gold in 2019 (adding featured holes coverage during Golf Channel's windows as well). Since 2017, following a pilot at the end of the 2016 season, portions of the PGA Tour Live coverage are also carried for free via the PGA Tour's Twitter account. In 2005, the PGA Tour reached a deal with XM Satellite Radio to co-produce a channel, the PGA Tour Network (now Sirius XM PGA Tour Radio), featuring event coverage and talk programming. Its contract with Sirius XM was renewed through 2021. The PGA Tour is also covered extensively outside the United States. In the United Kingdom, Sky Sports was the main broadcaster of the tour for a number of years up to 2006. Setanta Sports won exclusive UK and Ireland rights for six years from 2007 for a reported cost of £103 million. The deal includes Champions Tour and the Nationwide Tour events, but like the U.S. television deals it does not include the major championships, and unlike the U.S. deal, it does not include the World Golf Championships. Setanta set up the Setanta Golf channel to present its coverage. On June 23, 2009, Setanta's UK arm went into administration and ceased broadcasting. Eurosport picked up the television rights for the remainder of the 2009 season. Sky Sports regained the TV rights with an eight-year deal from 2010 to 2017. In South Korea, SBS, which has been the tour's exclusive TV broadcaster in that country since the mid-1990s, agreed in 2009 to extend its contract with the PGA Tour through 2019. As a part of that deal, it became sponsor of the season's opening tournament, a winners-only event that was renamed the SBS Championship effective in 2010. In 2011 however, Korean automobile manufacturer Hyundai took over the title sponsorship, but SBS still remains a sponsor of the event. In June 2018, it was announced that Eurosport's parent company Discovery Inc. had acquired exclusive international media rights to the PGA Tour outside of the United States, beginning 2019, under a 12-year, US$2 billion deal. The contract covers Discovery's international channels (including Eurosport), sub-licensing arrangements with local broadcasters, and development of an international PGA Tour over the top subscription service—which was unveiled in October under the brand GolfTV. The service will replace PGA Tour Live in international markets as existing rights lapse, beginning with Australia, Canada, Italy, Japan, the Netherlands, Portugal, Russia and Spain in January 2019. GolfTV also acquired rights to the Ryder Cup and European Tour in selected markets, and signed a deal with Tiger Woods to develop original content centered upon him. Three of the four majors take place in eight weeks between June and August. In the past, this has threatened to make the last 2-1/2 months of the season anti-climactic, as some of the very top players competed less from that point on. In response, the PGA Tour has introduced a new format, the FedEx Cup. From January through mid-August players compete in "regular season" events and earn FedEx Cup points, in addition to prize money. At the end of the regular season, the top 125 FedEx Cup points winners are eligible to compete in the "playoffs", four events taking place from mid-August to mid-September. The field sizes for these events are reduced from 125 to 100 to 70 and finally the traditional 30 for the Tour Championship. Additional FedEx Cup points are earned in these events. At the end of the championship, the top point winner is the season champion. To put this new system into place, the PGA Tour has made significant changes to the traditional schedule. In 2007, The Players Championship moved to May so as to have a marquee event in five consecutive months. The Tour Championship moved to mid-September, with an international team event (Ryder Cup or Presidents Cup) following at the end of September. The schedule was tweaked slightly in both 2008 and 2009. After the third FedEx Cup playoff event, the BMW Championship, the Tour takes a full week off. In 2008, the break came before the Ryder Cup, with the Tour Championship the week after that. In 2009, the break was followed by the Tour Championship, with the Presidents Cup taking place two weeks after that. The Tour continues through the fall, with the focus on the scramble of the less successful players to earn enough money to retain their tour cards. A circuit known as the Fall Series, originally with seven tournaments but now with four, was introduced in 2007. In its inaugural year, its events were held in seven consecutive weeks, starting the week after the Tour Championship. As was the case for the FedEx Cup playoff schedule, the Fall Series schedule was also tweaked in 2008 and 2009. The first 2008 Fall Series event was held opposite the Ryder Cup, and the Fall Series took a week off for the Tour Championship before continuing with its remaining six events. The Fall Series saw major changes for 2009, with one of its events moving to May and another dropping off the schedule entirely. It returned to its original start date of the week after the Tour Championship. Then, as in 2008, it took a week off, this time for the Presidents Cup. It then continued with events in three consecutive weeks, took another week off for the HSBC Champions (now elevated to World Golf Championships status), and concluded the week after that. Most recently, the Fall Series was reduced to four events, all held after the Tour Championship, for 2011. This followed the move of the Viking Classic into the regular season as an alternate event. 2007 saw the introduction of a tournament in Mexico, an alternate event staged the same week as the WGC-Accenture Match Play Championship. A tournament in Puerto Rico was introduced in 2008 as an alternate event staged opposite the WGC-CA Championship. The 2013 season, which was the last before the tour transitioned to a schedule spanning two calendar years, had 40 official-money events in 38 weeks, including three alternate events played the same week as a higher-status tournament. The other event that is considered part of the 2013 season is the biennial Presidents Cup, matching a team of golfers representing the USA with an "International" team consisting of non-European players (Europeans instead play in the Ryder Cup, held in even-numbered years). The CIMB Classic, a limited-field event held in Malaysia and the Tour's first sanctioned event in Southeast Asia. The field is limited to 40 players—the top-25 available players in the final FedEx Cup standings, the top ten available Asian players and five sponsor's exemptions, with at least one place reserved for a Malaysian player. The 2013 edition, which was part of the 2014 season, was the first as an official-money event. The WGC-HSBC Champions, traditionally held the week after the Malaysia tournament. Despite its elevation to World Golf Championships status in 2009, it initially was not an official-money event. Starting in 2010, if the event was won by a PGA Tour member, it counted as an official win and carried the three-year exemption of the other WGCs. Starting in 2013, the HSBC Champions became an official money event, and wins are official for Tour and non-Tour members alike. Most members of the tour play between 20 and 30 tournaments in the season. The geography of the tour is determined by the weather. It starts in Hawaii in January and spends most of its first two months in California and Arizona during what is known as the "West Coast Swing" and then moves to the American Southeast for the "Southern Swing." Each swing culminates in a significant tour event. In April, tour events begin to drift north. The summer months are spent mainly in the Northeast and the Midwest, and in the fall (autumn) the tour heads south again. In most of the regular events on tour, the field is either 132, 144 or 156 players, depending on time of year (and available daylight hours). All players making the cut earn money for the tournament with the winner usually receiving 18% of the total purse. In 2008, the PGA Tour Policy Board approved a change in the number of players that will make the cut. The cut will continue to be low 70 professionals and ties, unless that results in a post-cut field of more than 78 players. Under that circumstance, the cut score will be selected to make a field as close to 70 players as possible without exceeding 78. Players who are cut in such circumstances but who have placed 70th or worse will get credit for making the cut and will earn official money and FedEx Cup points. This policy affected two of the first three events with cuts, the Sony Open in Hawaii and the Buick Invitational. In late February, the Policy Board announced a revised cut policy, effective beginning with the Honda Classic. The new policy calls for 36-hole cut to the low 70 professionals and ties and, if that cut results in more than 78 players, a second 54-hole cut to the low 70 professionals and ties. Those who do not survive the 54-hole cut are designated as MDF (made the cut, did not finish). In the event that the PGA Tour cannot guarantee four rounds of play, the PGA Tour can shorten an event to 54 holes. A 54-hole event is still considered official, with full points and monies awarded. Any tournament stopped before 54 holes can be completed is reverted to the 36-hole score and the win is considered unofficial. The PGA Tour maintains a priority ranking system that is used to select the fields for each tournament on tour. Below is the 2016–17 ranking system, in order of priority. A. Not less than two sponsor invitees shall be PGA Tour members not otherwise exempt. B. Not less than two of the 2016 Top Finishers of the Web.com Tour, if not all can otherwise be accommodated. Two international players designated by the Commissioner. The current PGA Club Professional Champion up to 6 open events (3 must be opposite The Open Championship and World Golf Championships events), in addition to any sponsor selections. The exemption does not apply to open, limited-field events. PGA Section Champion or Player of the Year of the Section in which the tournament is played. Four low scorers at Open Qualifying which shall normally be held on Monday of tournament week. A. Winners prior to July 28, 1970: unlimited exemptions for such events. B. Winners after Jan. 1, 2000: five seasons of exemptions for such events. Life Members (who have been active members of the PGA Tour for 15 years and have won at least 20 co-sponsored events). Top 125 on the previous season’s FedExCup points list. Leading Money Winner from the previous season’s Top 25 regular season players using combined money earned on the Official Web.com Tour Regular Season Money List and Web.com Tour Finals Money List, Leading Money Winner from the previous season’s Web.com Tour Finals and Three-Time Winners from previous season Web.com Tour. Top 10 and ties, not otherwise exempt, among professionals from the previous open tournament whose victory has official status are exempt into the next open tournament whose victory has official status. Some tournaments deviate from this system; for example, the Phoenix Open has only five sponsor exemptions and three Monday qualifying spots, while invitational tournaments such as the Arnold Palmer Invitational, Memorial Tournament, and Dean & DeLuca Invitational have completely different eligibility categories. Majors: The four leading annual events in world golf are the Masters Tournament, U.S. Open, The (British) Open Championship, and the PGA Championship. These events each automatically receive 100 OWGR points. World Golf Championships (WGC): A set of events co-sanctioned by the International Federation of PGA Tours which attract the leading golfers from all over the world, including those who are not members of the PGA Tour. Note that the HSBC Champions was made a WGC event in the middle of the 2009 season. Because it takes place after The Tour Championship, it does not currently count as an official money event or an official win, but the winner is invited to the following season's edition of the winners-only Hyundai Tournament of Champions. Beginning in 2010, if the winner is a PGA Tour member, the victory will count as an official win and the winner will receive a three-year Tour exemption (as with other WGC winners). Once the PGA Tour changes to an October–August season in 2013, the HSBC Champions will become an official money event, and victories will be official for PGA Tour members and non-members alike. The Hyundai Tournament of Champions, the first tournament of the calendar year, has a field consisting of winners from the previous season's competition only. This results in a field much smaller than any other tournament except for The Tour Championship, with no cut after 36 holes of play. The Players Championship is the only event, apart from the majors and the World Golf Championships, which attracts entries from almost all of the world's elite golfers. It is the designated OWGR flagship event for the PGA Tour and awards 80 OWGR points to its winner. Only major championships can be awarded more OWGR points. For purposes of the FedEx Cup standings, The Players has had an identical point allocation to that of the majors since the Cup was instituted in 2007. 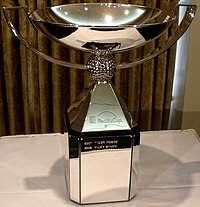 The FedEx Cup, presented to the winner of the season-ending playoffs. Playoff event: The last four tournaments of the FedEx Cup have fields based on the FedEx Cup standings. The top 125 players on the points list are entered in the Barclays Classic. Each week after that fields are cut: Deutsche Bank Championship to the top 100 players; BMW Championship to 70 players; The Tour Championship to 30 players. 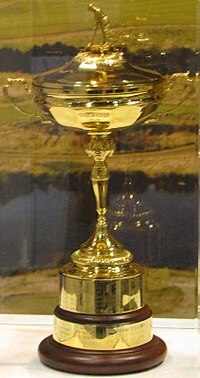 The Ryder Cup, contested in even-numbered years between teams from Europe and the United States. Team: A United States team of 12 elite players competes in the Ryder Cup and the Presidents Cup in alternate years. The Ryder Cup, pitting a team of U.S. golfers against a European team, is arguably the highest profile event in golf, outranking the majors. The Presidents Cup, which matches a team of U.S. golfers against an international team of golfers not eligible for the Ryder Cup, is less well established, but is still the main event of the week when it is played. There is no prize money in these events, so they are irrelevant to the money list, but an immense amount of pride rides on the results. Its position in the schedule, which influences the number of leading players that choose to enter. Its age and the distinction of its past champions. The repute of the course on which it is played. The HP Byron Nelson Championship, named after Byron Nelson, was until 2007 the only current event named after a PGA Tour golfer. The Arnold Palmer Invitational, formerly the Bay Hill Invitational, closely identified with Arnold Palmer and played at a resort he owns. The Northern Trust Open and the Fort Worth Invitational, both identified with Ben Hogan, although the Colonial is more closely identified with him since he won that tournament five times. The Memorial Tournament, founded by Jack Nicklaus, played on a course he designed, and annually honoring a selected "legend." The Quicken Loans National, while not hosted by a "legend," was able to gather a strong field because it was hosted by Tiger Woods. Alternate: Events which are played in the same week as a higher status tournament (either a WGC or the Open Championship) and therefore have weakened fields and reduced prize money. They are often considered an opportunity for players who would not qualify for certain events due to their world rankings, positions on the FedEx Cup points list, or position on the Tour's priority list to move up more easily or have an easier attempt at a two-year exemption for winning a tournament. Because of their weaker fields, these events usually receive the minimum amount of world ranking points reserved for PGA Tour events (24 points) and fewer FedEx Cup points than most tournaments (300 points instead of 500). Alternate event winners also do not earn Masters invitations. Fields for alternate events have 132 players. These events have 12 unrestricted sponsor exemptions, four more than the regular events. Fall Series (defunct): Prior to the 2013 season, the PGA Tour included a fall series consisting of those events after the final playoff event of the FedEx Cup season (The Tour Championship) through the end of the calendar year. These events provided extra opportunities for players to retain their cards by finishing within the top 125 of the money list. Since fall 2013 (the 2014 season), the events held in the fall have opened the tour season, and receive full FedEx Cup points allocations and Masters invitations. There are also a number of events which are recognized by the PGA Tour, but which do not count towards the official money list. Most of these take place in the off season (November and December). This slate of unofficial, often made-for-TV events (which have included the PGA Grand Slam of Golf, the Wendy's 3-Tour Challenge, the Franklin Templeton Shootout, the Skins Game, etc.) is referred to as the "Challenge Season" or more commonly as the "Silly Season." On March 20, 2012, the tour announced radical changes to the tour's season and qualifying process. Further details of these changes relating to the Fall Series were announced on June 26, with the remaining details announced on July 10. One of the final details received a minor tweak, effective for the 2013 season only, on September 11. First, the 2013 season was the last to be conducted entirely within a calendar year. Since the 2014 season, the season starts in October of the previous calendar year, shortly after the Tour Championship. The tournaments in the now season-opening Fall Series are awarded full FedEx Cup points. As a result of the schedule change, the qualifying school no longer grants playing rights on the PGA Tour, but only privileges on the Web.com Tour. The criterion for retaining tour cards at the end of the season also changed. Through 2012, the top 125 players on the money list at the end of the PGA Tour season retained their tour cards. For the 2013 season only, the top 125 players on both the money list and the FedEx Cup points list at the end of the FedEx Cup regular season in August retained their cards. The tour also said that it would decide at a later time whether to keep this aspect of the qualifying system in place in future seasons. Otherwise, the planned move by the tour to have the top 125 players on the FedEx Cup points list retain their tour cards took effect with the 2014 season. The next 75 players on the points list, along with the top 75 on the money list of the Web.com Tour at the end of that tour's regular season, are eligible to play a series of three tournaments in September known as the Web.com Tour Finals. The Finals field, however, is not expected to consist of all 150 players, as some of the PGA Tour players will be exempt by other criteria, such as a tournament win in the previous two years. A total of 50 PGA Tour cards for the next season is awarded at the end of the Finals. The 25 leading money winners during the Web.com Tour regular season receive cards, and total money earned during the Finals determines the remaining 25 card earners. For all 50 new card earners, their positions on the PGA Tour's priority order for purposes of tournament are be based on money earned in the Finals. College players who turn professional can enter the series if their earnings are equivalent to a top-200 PGA Tour or top-75 Web.com Tour finish. In addition, the leading money winners on the Web.com Tour in both the regular season and Finals receive automatic invitations to The Players Championship (note that if a golfer tops both money lists, only one Players invitation is awarded). Finally, two events held in Asia after the end of the PGA Tour's current regular season – the CIMB Classic in Malaysia and the HSBC Champions, a World Golf Championships event held in China – became full PGA Tour events, with official prize money, for the first time. Before 2013, neither event had full PGA Tour status despite being sanctioned by the Tour. Wins in the CIMB Classic were not classified as official PGA Tour wins, and HSBC Champions victories were official wins only for current PGA Tour members. Money earned in these events did not count as official PGA Tour earnings for any purpose. Players who lead the money list on the PGA Tour win the Arnold Palmer Award (since 1981). 1923 5: Walter Hagen, Joe Kirkwood, Sr.
PGA Tour players compete for two player of the year awards. The PGA Player of the Year award dates back to 1948 and is awarded by the PGA of America. Since 1982 the winner has been selected using a points system with points awarded for wins, money list position and scoring average. The PGA Tour Player of the Year award, also known as the Jack Nicklaus Trophy, is administered by the PGA Tour and was introduced in 1990; the recipient is selected by the tour players by ballot, although the results are not released other than to say who has won. More often than not the same player wins both awards; in fact, as seen in the table below, the PGA and PGA Tour Players of the Year have been the same every year from 1992 through 2018. The Rookie of the Year award was also introduced in 1990. Players are eligible in their first season of PGA Tour membership if they competed in less than seven events from any prior season. Several of the winners had a good deal of international success before their PGA Tour rookie season, and some have been in their thirties when they won the award. In March 2012, a new award, the PGA Tour Courage Award, was introduced in replacement of the defunct Comeback Player of the Year award. Note: No award was presented in 1968 due to the rift between the PGA of America and the professional golfers on the PGA tour. A complete list updated weekly is available on the PGA Tour's website. Due to increases in prize funds over the years, this list consists entirely of current players. Two players on the list, Vijay Singh and Davis Love III, are eligible for PGA Tour Champions (having respectively turned 50 in February 2013 and April 2014). Both have lifetime exemptions on the PGA Tour for 20 wins and 15 years on the Tour, and Love has won a tournament on the main PGA Tour since turning 50. The figures are not the players' complete career prize money as they do not include FedEx Cup bonuses, winnings from unofficial money events, or earnings on other tours such as the European Tour. In addition, elite golfers often earn several times as much from endorsements and golf-related business interests as they do from prize money. ^ a b "PGA War On". Toledo Blade. Ohio. Associated Press. June 15, 1967. p. 42. ^ Burke, Monte (May 8, 2013). "The PGA Tour: A Not-For-Profit Money Machine". Forbes. Retrieved August 1, 2018. ^ Mafi, Nick (January 19, 2018). "Foster + Partners Unveils Its Stunning Design of the New PGA Tour Headquarters". Architectural Digest. Retrieved October 31, 2018. ^ Mile, Chris (2009). "Golf Organizations – How Golf Works". Miles of Golf. Retrieved October 31, 2018. ^ "Internal PGA feud flares again". Palm Beach Post. UPI. July 26, 1966. p. 13. ^ a b Awtrey, Stan (February 11, 2009). "Professionals' split was a good thing for the game". PGA Tour. Retrieved August 30, 2013. ^ "Feud sours picture at Open". Spartanburg Herald. South Carolina. Associated Press. June 14, 1967. p. 14. ^ "Touring pros studying break". Spokesman-Review. Spokane, Washington. Associated Press. July 23, 1968. p. 12. ^ McCarthy, Denis (August 14, 1968). "Golf tour pros break with PGA". Palm Beach Post. p. 19. ^ a b Green, Bob (August 20, 1968). "Rebel golfers number 205: pros form APG". Eugene Register-Guard. Oregon. Associated Press. p. 3B. ^ "Touring golf pros set up own shop". Milwaukee Journal. press dispatches. August 20, 1968. p. 11. ^ "Rebel touring pros organize to battle for tournament, television jackpot". Palm Beach Post. Associated Press. August 20, 1968. p. 15. ^ Mulvoy, Mark (September 2, 1968). "The revolt of the touring pros". Sports Illustrated: 20. ^ Nicklaus, Jack (September 16, 1968). "Rebuttal to a searing attack". Sports Illustrated: 30. ^ "Making an impact: Golf 1895-2004". USA Today. January 8, 2004. Retrieved August 13, 2012. ^ "PGA, sponsors eye settlement". Eugene Register-Guard. Oregon. Associated Press. September 6, 1968. p. 3B. ^ "History: 1960–69". PGA of America. Retrieved August 30, 2013. ^ a b "Tour golfers, PGA settle fuss over tourney control". Spokesman-Review. Spokane, Washington. Associated Press. December 14, 1968. p. 15. ^ a b "Pro golf struggle is settled; PGA forms tourney group". Milwaukee Journal. December 14, 1968. p. 18. ^ "A year later and, peace on golf tour". Daytona Beach Morning Journal. Florida. Associated Press. August 5, 1969. p. 8. ^ "Dey named new czar of pro golf". Spokesman-Review. Spokane, Washington. Associated Press. January 23, 1969. p. 12. ^ "Dey named new player commissioner". Lodi News-Sentinel. California. UPI. January 23, 1969. p. 10. ^ "Beman faces change, challenge in golf". Lakeland Ledger. Florida. Associated Press. January 6, 1974. p. 6C. ^ "History: 1970–79". PGA of America. Retrieved August 13, 2012. ^ "Monahan appointed as PGA Tour's next Commissioner". PGA Tour. November 7, 2016. ^ "Pro Golf Tour Changes Name". The New York Times. August 31, 1981. Retrieved June 18, 2008. ^ "Touring pros get new name - TPA". Eugene Register-Guard. Oregon. Associated Press. August 31, 1981. p. 2B. ^ "Tour Changes Its Name Again". New York Times. March 20, 1982. Retrieved June 17, 2008. ^ "Professional golf gets a new look". Montreal Gazette. Associated Press. March 20, 1982. p. H10. ^ "PGA Tour moves licensing business". SportsBusinessDaily.com. Retrieved January 24, 2019. ^ Martin, Sean (December 17, 2013). "Q-School roundup: Status breakdown". PGA Tour. Retrieved January 8, 2014. ^ "What is the Web.com Tour Battlefield Promotion and how do you earn it?". TheGolfNewsNet.com. Retrieved January 24, 2019. ^ "Isabelle Beisiegel earns men's tour card". ESPN. Associated Press. May 27, 2011. Retrieved August 22, 2013. ^ "PGA Tour Charity Blog". PGA Tour. Archived from the original on June 29, 2011. Retrieved May 18, 2012. ^ "Running a charity on the PGA Tour". PGA Tour. January 7, 2018. ^ Andreeva, Nellie (September 1, 2011). "PGA Tour Signs New 9-Year Agreements With NBC & CBS". Deadline. Retrieved November 18, 2018. ^ Wacker, Brian (September 3, 2017). "PGA Tour opts to continue its relationship with CBS, NBC". Golf Digest. Retrieved November 18, 2018. ^ "PGA Tour signs 9-year extension with networks". ESPN. September 1, 2011. Retrieved November 18, 2018. ^ "Analysis: CBS, NBC Extend PGA Rights, But Golf Channel Also Gains". Multichannel. Retrieved November 18, 2018. ^ Spangler, Todd (July 31, 2018). "NBC Sports, PGA Tour Ink Three-Year Deal for Live-Streaming Golf Subscription Package". Variety. Retrieved August 1, 2018. ^ "PGA Tour, Twitter Extend Multi-year Deal for Free Global Streaming of PGA Tour Live". Sports Video Group. Retrieved January 27, 2019. ^ "XM, PGA Ink Golf Channel Agreement". Radio World. March 15, 2005. Retrieved November 18, 2018. ^ "SiriusXM Extends Deal For PGA Tour Radio". All Access. March 12, 2018. Retrieved November 18, 2018. ^ "Broadcaster is seeking £200m for TV soccer". The Sunday Times. July 1, 2006. ^ "Eurosport to show remainder of 2009 Tour events in UK" (Press release). PGA Tour. June 25, 2009. Retrieved August 30, 2013. ^ "Sky Sports, PGA Tour extend deal for U.K viewers". PGA Tour. November 23, 2009. Retrieved August 30, 2013. ^ "SBS to sponsor season-opening event through 2019" (Press release). PGA Tour. May 7, 2009. Retrieved August 30, 2013. ^ "Hyundai taking over sponsorship at Kapalua". PGA Tour. November 4, 2010. Retrieved August 30, 2013. ^ Murray, Ewan (June 4, 2018). "Sky faces battle to keep golf rights as PGA Tour strikes $2bn Discovery deal". The Guardian. Retrieved June 5, 2018. ^ Clarke, Stewart (June 4, 2018). "Discovery Inks International Deal for PGA Tour Golf Rights". Variety. Retrieved June 5, 2018. ^ Clarke, Stewart (October 22, 2018). "Discovery and PGA Tour Tee Up 'GOLFTV' Streaming Brand for 2019 Launch". Variety. Retrieved November 18, 2018. ^ Weinman, Sam. "Tiger Woods, Discovery's GOLFTV, announce exclusive content partnership promising "unparalleled" insight into golfer". Golf Digest. Retrieved January 4, 2019. ^ Lafayette, Jon. "Discovery Expands GolfTV With European Tour Deal". Broadcasting & Cable. Retrieved January 4, 2019. ^ "PGA Tour to conduct official-money event in Mexico". PGA Tour. January 13, 2006. Archived from the original on January 8, 2008. Retrieved May 18, 2012. ^ "First Tour-sanctioned event in Southeast Asia set for October" (Press release). PGA Tour. March 3, 2010. Retrieved August 30, 2013. ^ a b "China gets World Golf Championship with asterisk". Golf.com. Associated Press. April 29, 2009. Retrieved September 30, 2009. ^ a b "HSBC Champions, Round 1 Notebook, HSBC Champions and PGA Tour eligibility". PGA Tour. Retrieved August 30, 2013. ^ "PGA Tour Policy Board makes immediate changes to cut policy" (Press release). PGA Tour. February 28, 2008. Retrieved August 30, 2013. ^ "2016-17 PGA Tour Eligibility Ranking". Retrieved July 22, 2017. ^ "2017–18 PGA Tour Player Handbook & Tournament Regulations" (PDF). Retrieved July 11, 2018. ^ "PGA Tour announces changes". ESPN. March 21, 2012. Retrieved March 23, 2012. ^ Harig, Bob (March 21, 2012). "Decoding tour's schedule changes". ESPN. Retrieved March 23, 2012. ^ a b "Fall Series events to offer full FedExCup points" (Press release). PGA Tour. June 26, 2012. Retrieved August 30, 2013. ^ a b c d Elling, Steve (July 10, 2012). "PGA Tour finalizes controversial makeover as Qualifying School gone after six-decade run". CBS Sports: Eye on Golf. Retrieved July 10, 2012. ^ a b c "Notes: Consistency becomes even more important in 2013". PGA Tour. Associated Press. September 11, 2012. Retrieved August 30, 2013. ^ a b Dell, John (July 10, 2012). "Web.com impact expanded with qualifying changes". PGA Tour. Retrieved August 30, 2013. ^ "PGA Tour Player of the Year: Past winners". PGA Tour. December 18, 2009. Retrieved August 30, 2013. ^ "PGA Tour Rookie of the Year: Past winners". PGA Tour. December 18, 2009. Retrieved August 30, 2013. ^ Hoggard, Rex (September 23, 2013). "Stenson had a 'comeback' year, but won't receive award". Golf Channel. Retrieved September 24, 2013. ^ "Spieth clinches points-based PGA of America player of the year award". Fox Sports. Associated Press. August 18, 2015. ^ "No comeback player award this season". ESPN. November 8, 2011. Retrieved May 18, 2012. ^ Harig, Bob (November 11, 2009). "No comeback player of year in '09". ESPN. Retrieved May 18, 2012. ^ "PGA Tour Career Money Leaders". PGA Tour. Retrieved September 25, 2018.